Register now for the Gatan 3View Users Forum 2018 on Tuesday 20th March 2018 in Ghent, Belgium. This year the 3View User Forum will be hosted by the VIB Bioimaging Core. This event is a satellite meeting before the “From 3D Light to 3D Electron Microscopy” workshop. There will be two symposia sessions. Participants are invited to present a poster or request a 15 minute talk. Spaces are very limited, so speakers will be selected by the chairs to appeal to a broad audience from varying scientific backgrounds. Talks focussing on practical issues of applying 3View technology are preferred. If you would like to apply, please indicate on the registration form. There will also be a round table discussion with Gatan, giving you the opportunity to offer feedback directly to management and applications specialists. This event is free to attend, but numbers are limited to 90 participants on a first come, first served basis. Lunch will be provided. The venue is Flanders Institute for Biotechnology (VIB) in Ghent. 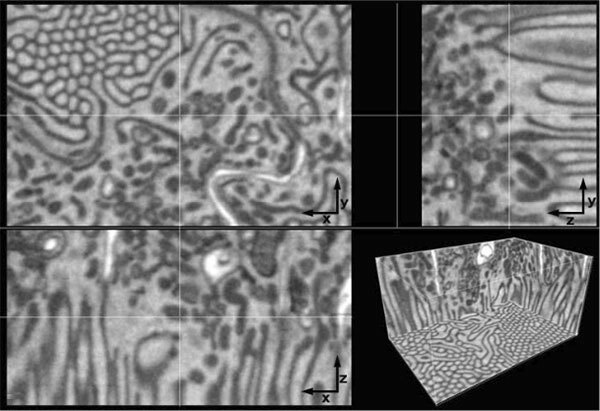 Mouse kidney prepared with the National Center for Microscopy and Imaging Research (NCMIR) 3View specimen preparation protocol embedded with Durcupan resin imaged with 7 nm pixels, and cut with 7 nm cuts creating 7 nm isotropic voxels.